IN TODAY’S RADIO REPORT: Arctic 40 to 50(!) degrees above normal; Obama bans offshore drilling in large parts of the Arctic and Atlantic; NOAA confirms climate change turbo-charged 24 extreme weather events in 2015; New poll shows majority of Trump voters support regulating carbon; PLUS: What Trump can’t change — solar energy is now the cheapest energy in the world… All that and more in today’s Green News Report! 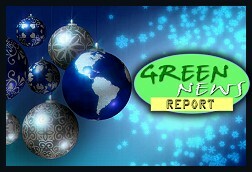 ‘Green News Report’ is heard on many fine radio stations around the country. For additional info on stories we covered today, plus today’s ‘Green News Extra’, please click right here to listen!